BBC Toybox is geared toward preschoolers and provides educational information, games, and puzzles, pages to color, and lots of stories about CBeebies star characters from BBC children’s TV shows. Buy a single copy or subscription to BBC Toybox magazine. 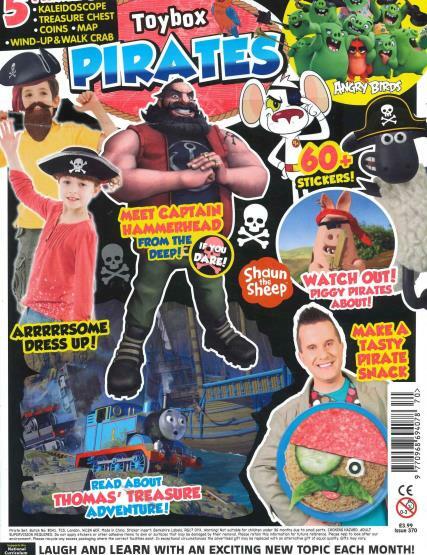 In the pages of BBC Toybox Magazine, you will find the familiar characters preschool children love such as Bob the Builder, Teletubbies, Fimbles, and other CBeebies cartoon characters. Children can follow along with the characters adventures while solving word puzzles, doing coloring, and learning about all kinds of things from numbers to facts about the oceans, to what is the weather. The children’s publication comes out three times a week so there is always more activities and fun to look forward to as children have little time to wait for the next publication. Each issue comes with free items including stickers and other small toys. BBC Toybox Magazine also runs competitions for young ones including a former contest where young storytellers could come up with their own ending for a Bob the Builder Story. Bob the Builder it seems is trying to fix a hole in the stage floor before a concert, and readers get to decide what happens next. The magazine is dedicated to youngsters use their creative skills, start to develop reading, writing and number abilities while having fun with games and stories. BBC Toybox also provides a way for children and adults to interact as they have fun and learn together.